1Nadir here refers to the lowest point in the sky the Sun reaches on that day (the opposite of culmination), rather than to the point opposite the Zenith. 2The terms masculine and feminine are not used to denote gender here, but rather to describe the basic duality, or bipolar force that exists in the universe. 3There are four additional phases to the lunation cycle when the Moon forms the crescent and gibbous shapes in the sky. Because these phases do not mark specific astronomical turning points in the cycle we will not explore them more fully here. Aurora Press and Antony Milner for the Lunation Cycle Phase Mandala and the Synodic Cycle diagrams, which were originally published in Dane Rudhyar's book The Lunation Cycle. Diurnal Cycle diagram reworked from one in American Astrology magazine. Thanks to Barbara Somerfield for her enormous help editing this article. Wondering what insights an astrological consultation from Nicki Michaels might offer you? Check out the possibilities. "Astrology can be defined as a technique for the study of life-cycles. Its main purpose (is to establish) the existence of regular patterns in the sequence of events constituting man’s inner and outer experience; then, to use the knowledge of these patterns in order to control or give meaning to these experiences...Indeed, the study of cycles----that is, of periodical activities in nature, human and otherwise----is the root of all significant knowledge, be it scientific or philosophical. And the study of cycles is a study of time." Visit the Rudhyar Audio Archives and listen to Dane Rudhyar himself discuss the lunation cycle, transpersonal astrology, and many other astrological topics. 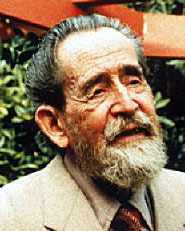 Dane Rudhyar is arguably the seminal astrological innovator of the twentieth century. His many contributions have been so thoroughly integrated into astrological thought that his concepts are often used by others with no awareness of, or attribution to their source. No one's ideas are more often used and less often understood than Rudhyar's. While his writings are vast, and necessitate time and study to comprehend, Rudhyar's most significant contributions to twentieth century astrology are, at the core, simple and elegant. They are based upon the common human experience of, and relationship to, the cycles of nature, and the understanding that time itself is cyclic and marked by periodic celestial events, such as the monthly lunation cycle as expressed in the Phase Mandala diagram above. Rudhyar recognized that astrology developed through early human's experience of the natural environment. The magnificence of the starry night sky inspires awe and wonder even today—imagine how it affected our early ancestors! The night and day cycle, the monthly waxing and waning of the Moon, and the yearly seasonal cycle define our most basic experiences of life. It is by understanding these cycles that we can comprehend the nature of all astrological cycles, and therefore human nature. A sidereal cycle measures a moving object in relation to a "fixed" background, and begins when the object crosses a particular point. The word sidereal derives from the Latin word for star, reflecting our perception of the star-filled heavens as fixed. Our diurnal (daily) cycle and yearly cycle are prime examples of sidereal cycles. The Sun's daily cycle is a diurnal cycle. While a diurnal cycle is actually one full revolution of the Earth on its axis, we experience it by noticing the Sun's changing relationship to the Earth's horizon, as seen from one place on Earth, over the course of a day. This relationship is reflected in the angles of an astrological chart, which mark the turning points of the Sun's daily cycle through the sky, i.e., rising at the Ascendant, culminating at the Midheaven, setting at the Descendant, and finally descending to the nadir,1 Nadir here refers to the lowest point in the sky the Sun reaches on that day (the opposite of culmination), rather than to the point opposite the Zenith. the lowest point of its daily cycle. Our yearly cycle is defined by the four seasons, which shift at the equinoxes and the solstices. While actually measuring one revolution of the Earth around the Sun, our geocentric perspective of the year is defined by the passing of the Sun through the twelve fixed sections of the ecliptic that we call the zodiacal signs. The zodiacal year begins when the Sun crosses the first degree of Aries, while the Sun entering each of the cardinal signs denotes the solstices and equinoxes, when the day/night ratio is the most extreme or most equally balanced, and thus marks the turning points of our seasons. The Greek term synodic refers to astronomical conjunctions. The synodic cycle measures the continually changing relationship between two moving bodies. 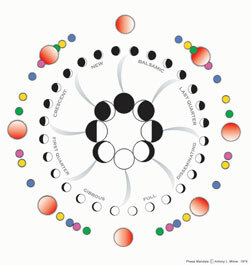 The stunning visuals of the lunation cycle clearly reveal the mutable relationship between the Sun and Moon, which Rudhyar perceived as the model for understanding all planetary aspects. A synodic cycle begins at the conjunction and ends at the next conjunction. Thus, the New Moon, the moment of the Moon's conjunction with the Sun, begins the new cycle of activity, and the Full Moon, at their opposition, marks the half-way point. All cycles, whether sidereal or synodic, share a common structure. First, there is a basic duality that exists in the universe, a bipolar force that can be referred to as yin/yang, male/female, night/day, or waxing/ waning. This duality is inherent in the structure of every cycle. These two polarities exist simultaneously, not as separate entities, but as interrelated dynamic halves of a whole. As the day force waxes, the night force wanes in direct proportion, and vice versa. This eternal interplay of cosmic in-breathing and exhaling is the universal dance of the cycles of life. Rudhyar termed the first half of any cycle involutionary, because at the beginning of any cycle there is an in-spiriting, an involvement of Spirit with matter. A new tone sounds, with its own particular qualities and characteristics, which resonates throughout the whole of that cycle. The initial impulse at the beginning of any cycle is formless, instinctual, exciting, and personalizing. During the entire first hemicycle, form slowly emerges and develops until it reaches culmination at the cycle's halfway point. Rudhyar termed the second half of any cycle either evolutionary or devolutionary depending on how it develops. At its onset, the second half of any cycle manifests a shift in consciousness from the building of form to the development of meaning. If this shift is successful, evolution occurs, bringing movement and growth rather than exact repetition. Devolution occurs when there is not forward development; instead of a spiral, there is only a circular repetition accompanied by the disintegration of form. Referring back to the archetypal universal dualities, the Sun represents the constant, masculine polarity, and the moon the mysterious, changeable feminine.2 The terms masculine and feminine are not used to denote gender here, but rather to describe the basic duality, or bipolar force that exists in the universe. The Sun symbolizes Spirit, so divine and beyond our human capacity to comprehend that we literally go blind if we stare directly at it. The Moon is the intermediary between Earth and Sun, humanity and Spirit. Recognizing that the lunation cycle reflects the soli-lunar relationship as seen from Earth, the Moon through her phases reflects the Sun’s light in a digestible way that won’t blind us. The actual conjunction of the luminaries is the moment of the in-spiriting of the new cycle, when the tone for that cycle is sounded. At the New Moon, the Moon is between the Earth and Sun and is invisible as she rises and sets with the Sun. (See Synodic Cycle diagram) The First Quarter Square marks the Moon's crossing of the Earth's orbit, outward towards the planet Mars, and therefore represents a reorientation that calls for action. At the Full Moon, the Earth is at its furthest from the Sun (and opposite the point of conjunction). This ending of the first half of the cycle represents the time of the fullness of form. Here's where a critical shift occurs away from the building of form and toward the development of greater understanding and deeper meaning. The Last Quarter Square occurs when the Moon once again crosses the Earth's orbit, this time moving inward toward the planet Venus, indicating the challenge of a major reevaluation. The cycle then ends at the next conjunction, and simultaneously a new cycle begins.3 There are four additional phases to the lunation cycle when the Moon forms the crescent and gibbous shapes in the sky. Because these phases do not mark specific astronomical turning points in the cycle we will not explore them more fully here. The tone or quality of that next beginning relies on the "success" of the previous cycle. Was understanding achieved during the second half of the cycle, or simply a breaking down of the form? Was this an evolutionary or devolutionary cycle? We now have an astrological understanding of the significance of the four cardinal points in any cycle, with any number of phases. Therefore, in the twelve-fold cycles of the zodiacal signs or the houses of a chart, the Cardinal signs and Angular houses will hold the most potency because of their position within their respective cycles. And in the geometry of planetary aspects, we can now understand that the squares and oppositions are considered challenging because they represent an archetype of change based on the astronomical structure of the lunation cycle. From Rudhyar's point of view, one cycle can be overlaid onto any other cycle, and regardless of the number of phases, corresponding points will have the same intrinsic meaning. Therefore, the Full Moon or halfway point in the eight-phase lunation cycle has a similar meaning to the Descendant (halfway around the twelve houses) or to the sign Libra (halfway through the twelve signs). Rudhyar's perspective offers a deeper comprehension of all planetary aspects. We understand the significant difference in meaning between the waxing and waning half of a cycle. Except for the conjunction and opposition, there are two of each type of aspect in every cycle. Therefore a waxing Sun-Jupiter trine in a birth chart has an intrinsically different meaning that a waning one. Likewise, the cosmic imprint on a person who is born just before a New Moon, in the Balsamic Phase, is radically different from someone born just after the New Moon, in the New Phase. From Rudhyar's perspective, while only certain planets are actually ever in aspect to each other at any particular moment in time, every planet is always in a phase relationship to every other planet. In order to identify the phase relationship of any two planets, think of the slower moving planet as stationary, and see how many degrees ahead of that point the faster moving planet is. If Venus (the faster moving planet) is 287° ahead of Mars, then these two planets are in the Last Quarter Square phase. This understanding of any planetary pair can be extremely informative. Rudhyar viewed life itself as a continual process of development composed of a series of interwoven astrological cycles. The birth chart is not a static entity; it represents a dynamic flow operating through time. It's not unlike a photograph of a person dancing. Implied in that photo are the steps leading up to the captured moment, as well as the continuation of the dance thereafter. There are several methods of understanding the unfolding of a life through time. The most primary is Rudhyar's pioneering use of the 30-year Progressed Lunation Cycle, which follows the relationship of the progressed Moon to the progressed Sun throughout the life. This cycle differentiates the developmental stages of people close to the same age, offering insight into the structure unique to each particular life. As an overlay to this cycle, planetary transits are used to measure events unfolding through objective time and secondary progressions to indicate the inner development through what Rudhyar called subjective duration. However, any planetary event must be understood in terms of where it falls within the structure of the Progressed Lunation Cycle. For example, the first Saturn return would have a very different meaning for someone experiencing it at the progressed First Quarter Square than if it occurred at the progressed Waning Cycle. "...Astrology is not merely a study of celestial cycles in themselves; it is a technique of interpretation of the meaning of these cycles with reference to the possibilities for growth in individuals...Its essential purpose—when true to its highest and truest function in human affairs—is to indicate the possibilities for individual development inherent in the significant turning points in the cycle of a human life."